Hot tub and pool product specialist Certikin International is promoting its complete ‘one-stop-shop’ credentials as part of its introduction of two new Fantasy Spas models to the thriving British wet leisure market this year. Launched in time for the spring season, the Aspire and Splendor models have now enhanced the entry-level options from the energy-efficient Fantasy Spas stable that also include the three-seater Embrace, four-seater Drift and five-seater Entice, which have been produced with technologically advanced polymers in a RokSolid shell and cabinet that have been produced by hot tub giant Watkins Manufacturing. 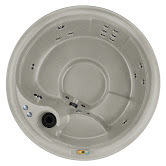 Like its Fantasy Spas counterparts, the Aspire has ‘plug and play’ functionality and is a diminutive two-person rectangular model with a double lounger design that is perfect for singles and couples and has the advantage of being able to fit through standard doorways; while the round Splendor is more ideal for socialising with family and friends as it has the capability to seat up to five people. Manufactured with a Unibody lightweight shell, the Aspire comes in (L,W,H) at 6’ x 3’11” x 28” and has a total of ten jets with stainless steel trim. It is available in a choice of three shell colours, Sand, Taupe and Espresso, and is supplied with a removable accessory tray, which can act as a table for drinks or games, and towel hooks. The round five-seater Splendor, pictured, also has a Unibody lightweight shell and provides a classic barrier-free seating design. It comes in at at 6’6”x 34” and has 18 jets with stainless steel trim. The shell colour choices are the same as the Aspire, while a built in diverter valve allows users to gain a personalised massage from the jets or take advantage of the whirlpool feature. During the 20th anniversary edition of SPATEX at the Ricoh Arena in Coventry a comprehensive range of products and services for hot tub and pool companies from Certikin included the introduction of the new Aspire and Splendor models to mark the first anniversary of the Fantasy Spas entry-level range being supplied by Certikin’s Endless Summer team, which also overseas the exclusive distribution of the Caldera Spas range as well as one-piece pools and enclosures. Certikin Commercial Director Ben Studdy and his Endless Summer colleagues are now casting the net to secure dealers for the low-cost and user-friendly rugged ‘plug and play’ roto-molded models in the Fantasy Spas range. “Along with our existing Fantasy Spas models, our new Aspire and Splendor options are available to all UK hot tub retailers who want to supply them as entry-level models in their showrooms,” said Ben. Along with its pedigree hot tub capabilities, and swim spa options from Catalina Spas, the wet leisure powerhouse is also promoting additional new pool products including the innovative Walu Deck and Walu Air pool covers, plus the OC-1 ‘future of swimming pool filtration’, as part of its complete package to the market. The unique Walu Deck decking system extends over and retracts from the pool to provide a safe and secure cover that can maximise space with its load-bearing design strength. “It helps to maximise space and is available at half the price of electronic cover systems that perform similar requirements,” reported Certikin General Manager Neil Stephenson. Designed for winterising pools securely, the Walu Air cover creates an inflated pillow that literally ‘plugs’ the shape of the pool to prevent debris entering and also providing an excellent visual deterent for animals and children. “We’ve had a lot of interest in this product because of the fact that it can be inflated in the middle very easily to then provide a completely secure cover over swimming pools,” reported Certikin Technical Sales Advisor Warren Davies. A new and safer enclosed Certi Dos dosing system has also been launched for Certikin’s pool specialist customers, which provides advanced connectivity to a cloud server to help supply alerts and dosing information that can be accessed by mobile devices. “It solves a lot of the safety issues that pool professionals are seeking to provide within the pool projects for their customers to eliminate the problem of coming into direct contact with chemicals,” said Certi Dos specialist Simon Jay. “All of the important elements of the dosing system are now in full view and are locked securely within a contained unit that can send alert messages to pool owners or their dedicated service suppliers. Certikin Marketing Manager Cath Saunders has been helping to promote the introduction of the latest Fantasy Spas models and believes the company’s complete ‘one-stop-shop’ capabilities for current and prospective hot tub and pool customers will be a major attraction this year for any dealers seeking pedigree products combined with inclusive professional support services. “Our aim, as always, is to highlight all of our hot tub and pool product capabilities and to provide promotion for our essential wet leisure service with unrivalled technical advice from our knowledgeable team,” said Cath. “If our clients need guidance and support to ensure that projects for their own customers run smoothly then they know that they can call us for guidance and support. For further details about taking advantage of Certikin’s ‘complete’ wet leisure services or to become a specialist Fantasy Spas UK hot tub retailer or for more information about opportunities to become a Caldera Spas dealership call Certikin on 01993 778855.